Has anyone taken measures to ward off the possibility of a home invasion? Certainly, the very thought of one should be horrifying. But what to do? Keep a bat or some other handy weapon in the closet or drawer? Is owning a gun and keeping it at home a good idea if you have young children? Do you think your studies in a traditional martial art would fare well against an intruder after being awoken in the middle of the night? 1. Always keep your head up when walking outside, this lets people know you are paying attention. 2. Never wear headphones in both ears when outside. If you must wear them only use one ear bud so your other ear is free to listen to your surroundings. 3. Try not to carry your purse in your hand, keep it on your shoulder where it is secure and cannot easily be removed. 4. Never unlock your car door until you can clearly see the surrounding area and are sure there is no one waiting to jump into your car. 5. Car keys are an excellent weapon; they are sharp and can be used if someone is grabbing you. If they are poked with the key they will quickly become distracted long enough for you to run. 6. Never be afraid to scream; make the most of the voice given to you and let people know you are in trouble. 7. If someone grabs your arm and you can perform a distraction drill; this can involve many things including stepping on their foot, pinching their other arm with your free hand. When you do the distraction, pull your arm free. If you do not have a free hand, use your knee. You know where to hit! 8. If you cannot use your arms or your knee, head butting is always a great option. This will blur their vision and distract them. At that point you should free your arm and run for help. 9. If you have a free hand, gouge them in the eyes, this will cause their eyes to water and give you the opportunity to run. Punching someone in the nose will always create the eye watering effect. 10. Should you see someone standing suspiciously near or next to your car, do not approach it; walk back into the building you just came from and call for help! The underlying theme here is awareness. Any additional suggestions would be appreciated. A member of our parish was the victim of a home invasion. The kids went to the parish school. The perpetrators are in prison. I hate hearing stories like Rick's. The long-term effects on the kids' lives is just a shame. Hi John, this is what I call 'reality based training'. This kind of stuff is much more useful than so called 'reality systems' teach. Basic awareness/avoidance training reaches far more people and deals with the actual 'realities' that people are far more likely to face in their lives. Thanks for posting it. Hmm, first - the probabilities of this occuring to any one of us is remote provided we live in a decent neighborhood, etc. What actually should be stressed is a self analysis of lifestyle. In that analysis you might find the probability very, very low and with proper awareness dump that low score right out the window. If your analysis puts you in a very high risk lifestyle then I would venture to say you might want to change your lifestyle if possible. Home invasion is rare and if you do the stats you might find extenuating circumstances which is what is wrong with this scenario, we don't have all the facts. We might find something else that attributes to the attack, etc. But I agree with everything SueC and Charles wrote, but Rick's experience shows that it can happen (home invasion), and should be considered as a possibility, however remote. Horrible. The perps being behind bars is little consolation. At least they caught them. Thanks for providing those links. Good stuff. Use of Deadly Force and Weapons: First or Last. Reality Based Systems - whose reality? ...the probabilities of this occuring to any one of us is remote provided we live in a decent neighborhood, etc. I suppose. Not remote enough from it almost happening to my wife several years ago. Some weirdo was following her around the supermarket and decided it would be fun to follow her home (I was at work). She realized this after she got into the house and he rang the doorbell, mumbling something unintelligible. Fortunately we live right next door to the police precinct. By the time they arrived this guy was gone and we never heard from him again. We have no idea what he was really up to or what could have potentially happened if my wife lost her cool. 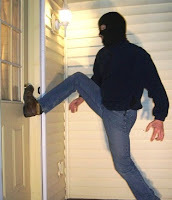 Realize that these tips are preventive measures that could be applied for a number of scenarios, not just "home invasions." Apparently we agree that awareness is key. I don't have any stats to back it up, but many home invasions do in fact happen in upscale "decent" neighborhoods. After all, that's where the money is. I wouldn't dream of advising a home invasion victim from an affluent neighborhood she had to downscale her real estate and/or change her "lifestyle" to prevent something like this from happening again. Cetainly an interesting issue. We've had a few home invasions that made the headline news up here in the Toronto area. Some of these were actually during the daytime. Unfortunately, some incidents ended up in murders and may have been targeted home invasions. Absolutly but in this instance security and secure actions are a good thing. Keeping the doors locked whether home or not. Observing the surroundings as you drive up and into the drive way. Checking the car as you approach from the rear looking in the back seat. Keep an eye peeled around you as the garage door opens. Do the same as you enter. Do some more with emphasis on behind you as the door closes. If the light does not come on when the door closes look around for any spots in the garage that may hide someone. You shouldn't have hiding spots in the garage anyway. Things to practice avoidance if you live in those neighborhoods or lifestyles, etc. Folks with money, sometimes, have the false assumption it cannot happen to them. The real value here is the story that it can happen to you or anyone. Unfortunately, some incidents ended up in murders and may have been targeted home invasions. Good point, remember if they got hit they had some indication of both an easy target and some security that was lacking that said, come here I am ready to be robbed, etc. Yes? Rick's store is horrible, i find it sickening that people actually do these things. Gun? Our countries have different viewpoint on the subject and I know I wouldn't keep one at home. When in doubt, hit the eyes and run? Actually that sounds like a good start. Tell your girls that eyes, throat and groin are key targets to thwart an attack. Good to hear from you, Mat.